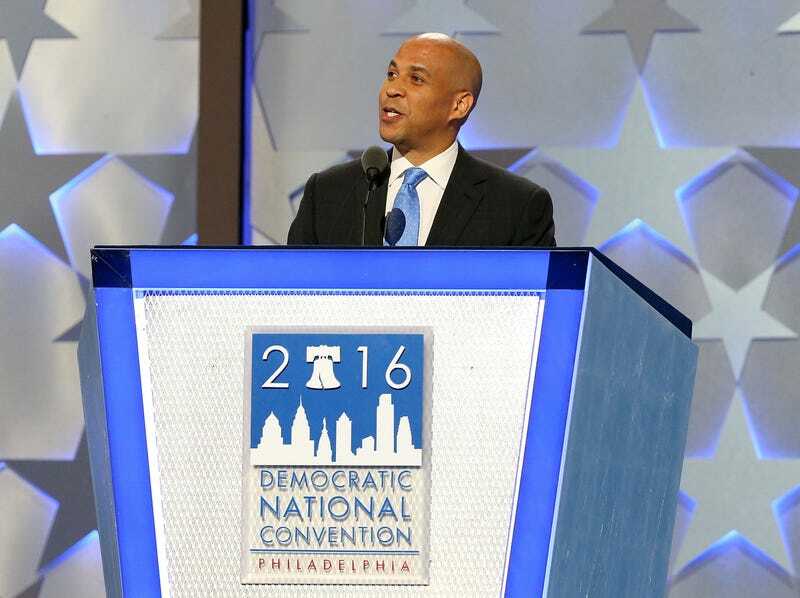 Sen. Cory Booker (D-N.J.) delivers remarks the first day of the Democratic National Convention at the Wells Fargo Center in Philadelphia on July 25, 2016. New Jersey Sen. Cory Booker isn't at all disturbed by Donald Trump's attack on him after Booker's speech at the Democratic National Convention on Monday. In fact, Booker has taken to responding to Trump with love, CNN notes. "I love Donald Trump," Booker said Tuesday on CNN's New Day. "I don't want to answer his hate with hate. I'm going to answer it with love. I'm not going to answer his darkness with darkness." It all started when the senator called out Trump in his speech, saying that he believes the election is a "referendum on who best embodies the leadership we need to go far together." "Donald Trump isn't that leader," Booker stated, going on to list all the reasons why, in his eyes, the Republican nominee falls short. Trump responded on Twitter by declaring, "If Cory Booker is the future of the Democratic Party, they have no future!" Booker brushed off Trump's suggestion that the Republican "knows more about Cory than he knows about himself." "He wants us to be speculating. It sounds so sinister," he told CNN. "I don't care; I love you, Donald. I pray for you. I hope that you find some kindness in your heart, that you're not going to be somebody that spews out insults to your political opposition, that you're going to find some way to love." For Booker's part, that love, of course, doesn't extend to an endorsement of Trump as president. "I love you. I just don't want him to be my president. I don't want you to have the White House to be spewing that kind of mean-spirited hate that doesn't even belong in a playground sandbox," Booker added. The senator said that he was going to continue his stance against Trump's policies. "I'm just gonna keep loving on him. I'm gonna tell the truth about him, but I'm going to keep loving on him," he said. "That kind of vitriol, that kind of meanness, has no place in the presidency. "Bring it on, Donald. Show your truth. I'm gonna show mine. Love you, brother," Booker added.